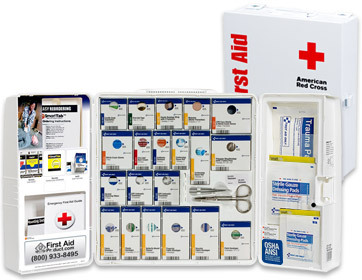 SmartCompliance™ First Aid Kits, First Aid Cabinets & Refills: GUARANTEED OSHA Compliance! OSHA SmartCompliance™ First Aid / OSHA Compliance First Aid Service Program. Deeper Discounts... If you are a large Organization looking to purchase more cabinets, email us about additional price breaks! 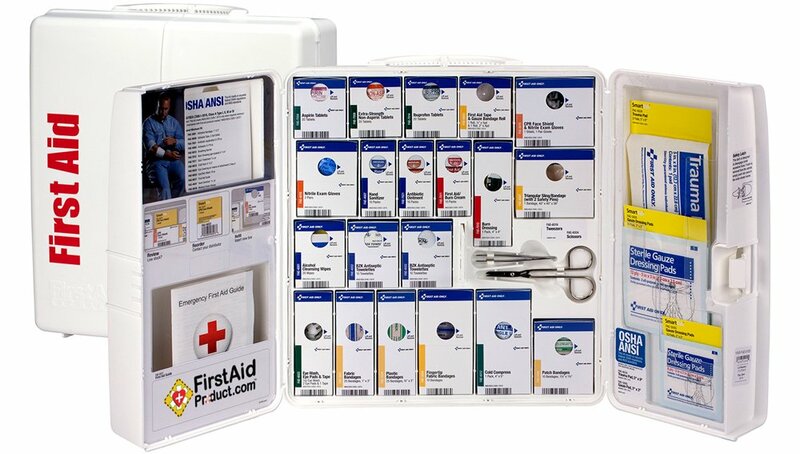 THE ONLY WAY TO GUARANTEE YOUR OSHA FIRST AID COMPLIANCE - AND WITH AN AUTOMATED FIRST AID REFILL SYSTEM BUILT IN! SMARTCOMPLIANCE™ MADE EASY. From Only $47.08 to $97.12 each ... Simply Revolutionary. 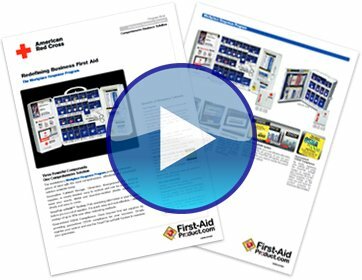 Click here to Purchase now... SmartCompliance™ is the only first aid solution that guarantees OSHA compliance. This is the first product that goes beyond supplies and provides peace of mind. Simply register your cabinet and use the SmartTab ezRefill System to maintain the guarantee. Additionally, should OSHA regulations change for your industry, the product will be made available to ensure compliance. OSHA requires it. We just make it simple. 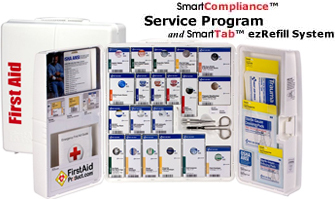 With the SmartCompliance™ First Aid Service Program, staying compliant just got easier. 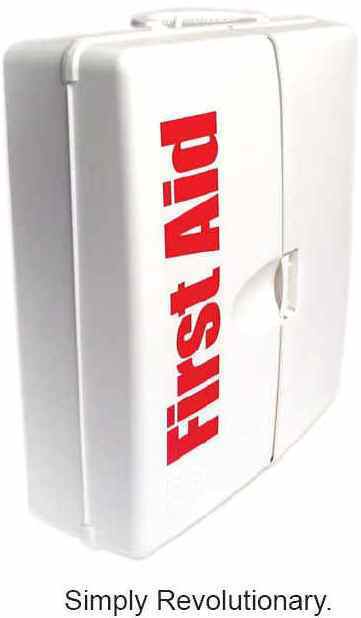 With guaranteed OSHA compliance and automatic $3.76 refills, this program allows you to FIRE your First Aid Van Service, save Thousands of Dollars each year, and rest assured you won't get fined! 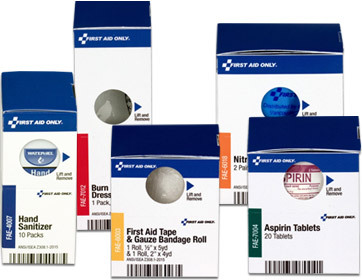 INEXPENSIVE first aid refills.. most items just $3.76. 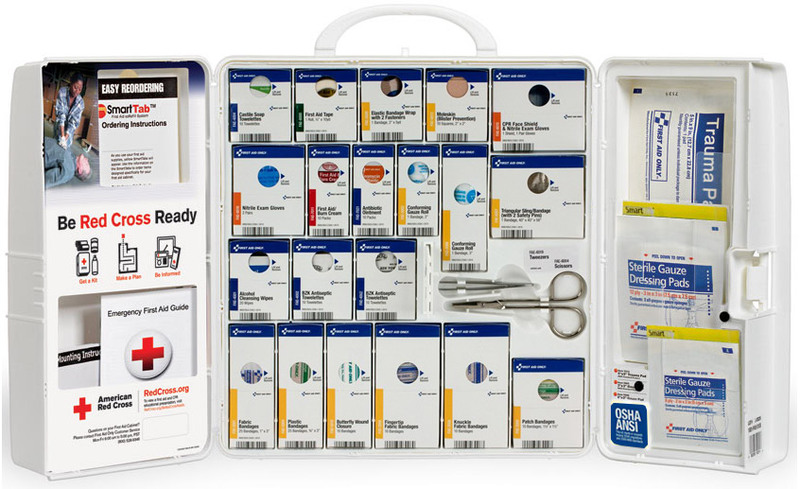 The SmartCompliance™ First Aid Service Program addresses the primary challenge with first aid in your business — depleted and disorganized first aid supplies that fail to meet OSHA regulations. SmartCompliance is the only first aid solution that guarantees OSHA compliance. This is the first product that goes beyond supplies and provides peace of mind. Simply register your cabinet and use the SmartTab ezRefill System to maintain the guarantee. Additionally, should OSHA regulations change for your industry, the product will be made available to ensure compliance. This simple but effective system for reordering and restocking revolutionizes replenishment. It is quick, easy, and cost effective. As supplies are used, SmartTab ezRefill reminder tabs notify you when it is time to reorder supplies and puts reorder information at your fingertips. This unique cabinet design eliminates disorganized and missing supplies. Clearly labeled compartments create a cabinet that is easy to use and restock. With the expansion pocket, you can customize your cabinet to meet your specific needs. This simple but effective system for reordering and restocking revolutionizes replenishment. Each refill has a bright yellow tab that shows about halfway through the supply, so you are informed that it is time to reorder. Each refill has the item number on the box as well as a bar code for scanning. As supplies are used, SmartTab ezRefill reminder tabs notify you when it is time to reorder supplies and puts reorder information at your fingertips.